Ok folks, you know the drill. This is the Regional Quarterfinals. By the way, the second round match ups are determined by the seeding. Before the tournament even began, the winner of 1 vs. 16 would match up against the winner of 8 vs. 9 and so on. There is no reseeding after every round, in case you wondered. Enjoy! If the world were just one city, that city would be New York City. Frank Sinatra did not sign about Fairbanks or Juneau or Anchorage. He sang about New York. A city so great, he had to sign it out loud twice: New York, New York. On paper, this match-up appeared to be lopsided. But if New York can said to be grand, you take a look at Kenai Peninsula at just try and tell me it lacks in grandeur. If New York can said to be opulent, you can take a look the barren north, drench in aurora borealis and tell me you don’t see nature’s most opulent wonder. Yes folks, we have a definite deadlocked game. Cityscapes or Landscapes – that truly is the question. In this Regional Quarterfinal, we are presented with the quintessential tourist question: do you want to see museums, art, nightlife, shopping and city life? Or would you rather go swimming in a glacial lake, hike through a virgin forest, camp out below the stars, and see wildlife in its natural habitat? To each his own, I would say. But how do we resolve this deadlock, given our current situation? Both teams have playing on into a 5th overtime, reminiscent of Syracuse –UConn in this year’s Big East championship. Believe it or not, NYC gets the nod. Quite simply, as far as cities go, there few if any cities on earth that can match New York. In terms of outdoors Alaska is great, don’t get me wrong, but it is not the greatest outdoor wilderness destination on earth, let alone in this region. For this reason, NYC gets the nod. Not to worry, I have a feeling that Mother Nature will have her revenge on Uncle skyscraper (new character I just created – copyright pending). A couple of upstart upsetters go head to head in Round 2. Could they be any different? In Newfoundland, you have a foggy, wet, isolated island that is dreary, dank, and dark most of the year. In the Pacific Coast Highway, you have a sunny, bright, and cheerful stretch of land in America’s Golden State: California. The very mention of the word puts a spark in your eye. It was not that long ago that desperate men traveled thousands of miles across the continent in search for gold and other minerals on California’s coast. As far as I know, Lief Ericksson and his band of ravaging Norsemen were the only ones who set out with such excitement to Newfoundland. And when they arrived, they realized there was not much there for them but fog, so they up and left, without even bothering to rid the land of their settlement – thus we have L’anse Aux Meadows. Of course, this all sounds like I’m disparaging “The Rock”. For these very reasons, Newfoundland is a glorious and magical place, where you can get away from it all and head into another world. California’s Coast is another place you can get away from it all. Although so close to the big cities, it is a world away – life is slower, more tranquil, more spiritual out there on the West. There is still a sense of adventure – all you need is a surf board (or floatable inner tube will do the trick too!) Personally, I would rather have some alone time in the sun, then in the fog! 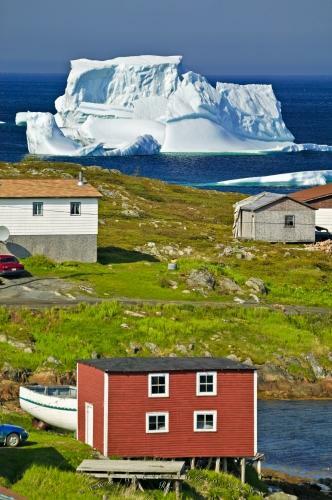 So, we bid adieu to Newfoundland, but you will almost be in our hearts. It seems like a mismatch in terms of numbers: Capitol Reef, Canyonland, Zion, Bryce and Arches take on Banff and Jasper. Five against two. Well, this is one of the rare match ups where I have been to both locations and I can say without a doubt that although Utah’s parks are beautiful, this beauty is dwarfed in the face of Canada’s Rockies. Although Banff and Jasper are the two headliners, while traveling between both you will visit Lake Louis, Yoho National Park, Kootenay National Park and Kananaskis County. The awe and stupendous grandeur of the Canadian Rockies is breathtaking, and I do not use this word lightly. Utah’s parks are serene and gorgeous and if you have nothing else to compare them to, you truly will believe they are nature’s greatest gift. In fact, while visiting these parks, I was awestruck by their beauty and could not fathom how anything could be any more beautiful. Then I visited the Grand Canyon and its shear enormity dazzled me. And the Grand Canyon did not even make this list – enough said. As such, I give props to my Canadian parks and the win goes to Banff and Jasper. North America’s best known outdoor destination comes up against what is perhaps North America’s least known outdoor destination, but one that seems to possess just as much reason for visiting. Tournament officials now realize the magnitude of their first round concession in allowing Yellowstone to be represented as the entire state of Wyoming. As in Round 1, their opponent now must deal with the full brunt of the state and not merely the world’s first National Park. Hadai Gwaii warriors are stopped in their track by the “Bear Tower”, the indigenous name for Devil’s Tower National Monument. Much how Devil’s Tower mesmerized Richard Dreyfuss, the Hadai Gwaii may now want to honour the tower with a monument made of mashed potatoes. Indeed, the majesty and mystique of the Queen Charlotte Islands has run into the only possible opponent that could rival it in terms of natural wonders, indigenous folklore, and open wilderness. Wyoming, the least populated state, offers visitors scenic panoramas, wide open spaces, and sky that goes on forever (to borrow Montana’s motto, this IS big sky country). And I haven’t even discussed Yellowstone. The world’s first national park, home to two thirds of the world’s geysers, Yellowstone is a land of rivers, mountains, canyons, and lakes. It is home to the largest caldera on the continent, and you will see water in every color imaginable. Old faithful may be the most over-hyped climax on the planet, until you witness the brute force of the earth’s eruption. Indeed, this is a place on earth where one can actually see how the earth itself lives. I grant Hadai Gwaii eternal respect and desperately hope to visit it one day soon; unfortunately, it happened to draw Wyoming – 44th in the Union, but first in my heart.